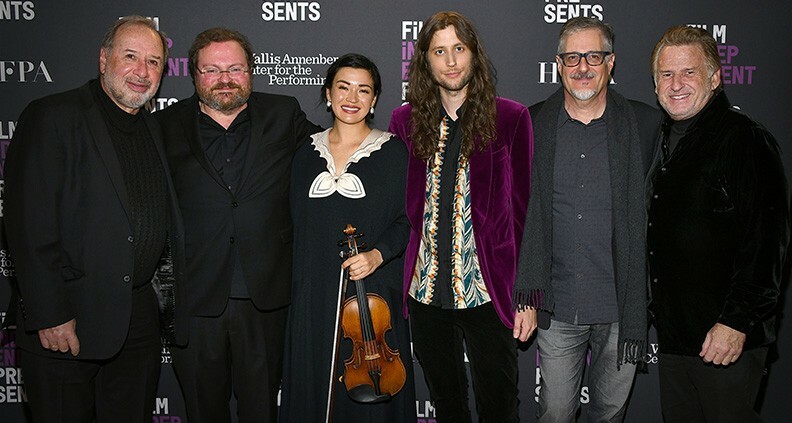 Entering the Film Independent Presents special event An Evening With Ludwig Göransson on January 15, attendees to the Wallis Annenberg Center for the Performing Arts in Beverly Hills found a stage set with multiple instruments arranged for performance. Chatting before the show, a fellow composer agreed that the scene seemed to set up for African percussion, some sort of guitar band and a string section (which turned out to be a quintet.) The eclectic mix of instruments seemed a good analogue for Göransson’s skyrocketing career as a film composer and pop producer. The lights dimmed as Film Independent Presents curator Elvis Mitchell stepped out to welcome us. From the get-go, Mitchell mixed lighthearted quips and observations with palpable appreciation and insight into the musical talent being honored. The night began with a short documentary piece about the making of Göransson score for Ryan Coogler’s Black Panther, for which Göransson has received his first Oscar nomination. The doc told the story of Göransson’s journey to use African music as the foundation of the 2018 Marvel movie’s soundtrack. Before heading to Africa, the Swedish-born composer was introduced to the music of Senegalese vocalist Baaba Maal. Maal invited Göransson to Senegal, where he encountered the sounds, instruments and musicians that would begin to form the aural backdrop of Coogler’s film. Mitchell began by asking how Göransson felt music helps localize audiences within a specific environment for a film. They talked about Fruitvale Station (a prior Coogler collaboration) and its relationship to Oakland, relating it to Black Panther’s relationship to Africa. Göransson gave an example of sampling the BART commuter train at Fruitvale Station in Oakland, then building that sound into the score. Göransson said he thinks of music as another element that the audience can use to understand where a film’s action is taking place, just as you can with dialogue, actors, set design and wardrobe. The composer went to Africa in search of music that would support the creation of mythical African nation of Wakanda. After reading the script Göransson knew he would put African drumming at the center of this musical landscape. But because it was a superhero film, he said, he also wanted big symphonic moments to support the action. It was a delicate balance to mix the percussion and symphony so that both had their full impact. 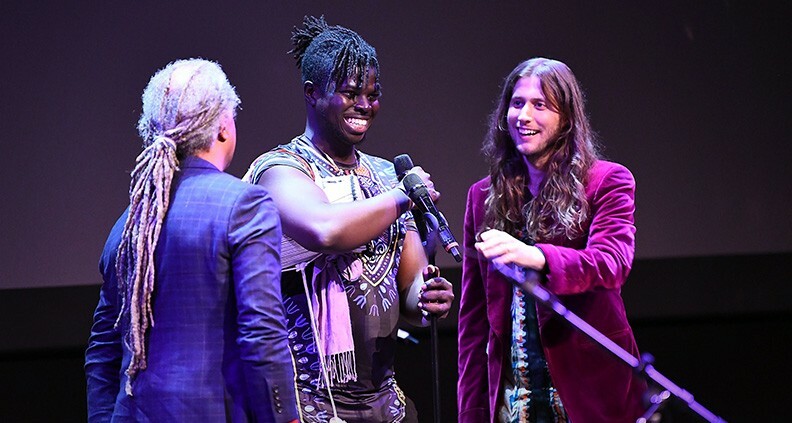 After a bit of discussion, musician Magatte Fall came out onstage for a stunning demonstration of the African “talking drum” showcasing all the instrument’s expressive power. 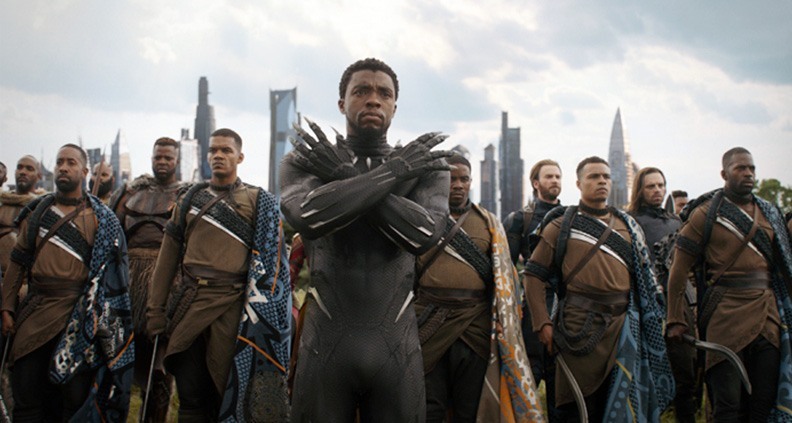 He played an example of the heroic theme, explaining that the theme for Black Panther’s protagonist is made up of three notes representing the three syllables of his name: T’Challa. Three more percussionists— Sekani Thomas, Nigel Zuniga and Kara Mac—then joined Magatte and performed four additional pieces, all on traditional drums. Musician Mac described one of the pieces as the “challenge music,” saying the motif would usually appear either when characters were preparing for battle, or for when a boy is becoming a man and gaining respect. Then played Black Panther’s famous “waterfall scene,” wherein Prince T’Challa is challenged to battle by a rival Wakandan tribal leader. After hearing the music played on stage and learning its origin, it was enlightening to hear how it was used as a recurring theme in the score. Continuing the interview, Mitchell and Göransson talked about the importance of collaborative relationships. Göransson has many: from scoring his first feature (2011’s 30 Minutes or Less) and later working with Ruben Fleisher on the director’s 2018 hit Spider-Man spinoff Venom, to working on TV comedies like Community (where he met Donald Glover, aka “Childish Gambino”) to his long collaboration with Ryan Coogler, stemming from their early college days together at USC. Prior to Community, Göransson had only known Glover as an actor. One day, Göransson got an email from Glover saying he was looking for someone to mix his new music. When he heard the track Glover sent over, he was blown away—offering to mix it himself. This was the beginning of a collaboration that has included three Childish Gambino albums, a number of top charting songs and multiple Grammy nominations. 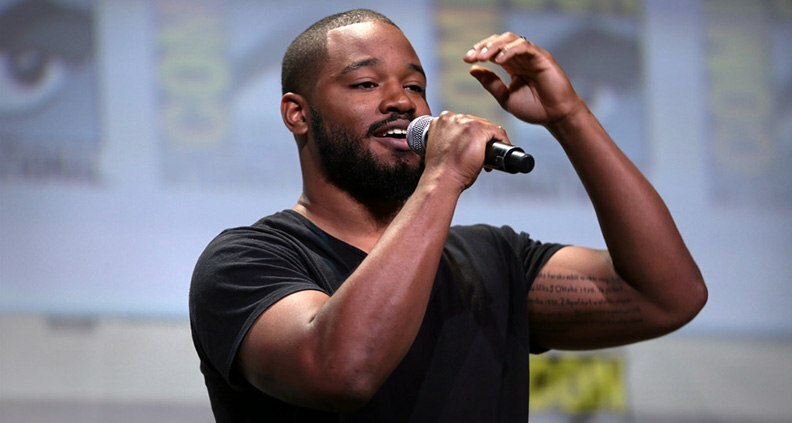 Göransson referred to the early days with Glover and Coogler, saying they had been “kids together”—providing a glimpse at how professional and personal relationships overlap over time. Göransson also referred to Community as a great musical training ground, as each episode typically used a different film genre as a jumping off point, requiring a range of compositional styles. He said it was like getting an assignment each time to create something new from a different musical tradition. Next, a string quintet (including Göransson’s wife, violinist Serena McKinney) then played music from Black Panther that accompanies the scene of T’Challa’s father’s death. The ensemble gave a beautiful rendition of the delicate and emotional piece. The scene then played, letting audiences hear how the somewhat sparse music fit in with—and supported—the onscreen action. Finally, Göransson picked up a guitar, introduced piano and bass players to the stage, and launched into the theme from Creed II. The piano intro was tasty and Göransson played the guitar melody with emotion. From beginning to end, the evening was informative and eclectic in both form and content. Switching from interview to performance and back again kept the interest level high. It was pure fun and felt like a celebration—even more so when the four drummers returned and joined in to complete the circle of celebration. For more information about upcoming Film Independent events, click here. To learn more about Film Independent Presents, click here.